Raaar, raaar, stomp, stomp – how does America do it differently? The monstrous creature Godzilla settles on the island of Manhattan; but when Nick Tatopoulos tries to study the creature, he realises the worst might still be to come. In a refreshing change, Matthew Broderick goes against the traditional muscular, alpha-male action hero found in other action films from the same period e.g. Will Smith in Independence Day or Bruce Willis in the Die Hard franchise. This brings a more intelligent and interesting angle as a scientist lead character as rather than seeing Godzilla as an enemy to defeat to save the city, he delves deeper into the biological past of the creature; interestingly, while he realises that it needs to be stopped he doesn’t seem to want to defeat it. “He’s not some monster trying to evade you. He’s just an animal.” This allows the audience to get more attached to the creature and almost feel sorry for it later in the film, which is a little annoying if truth be told. Where’s the creature that everyone should be scared of? A city being destroyed on a large scale is no stranger to modern audiences with the recent influx of destructive superhero movies, but the enormity of Godzilla adds a spectacle to enjoy and a sense of overwhelming power. With no enemies or weapons to match her magnitude or sheer strength, the creature stands out as a force to be reckoned with, and the CGI conveys this well. The humongous creature is obviously a massive step up from the traditional man in a suit that we see in many of the Japanese Godzilla films, and there’s no denying that this adds to the sense of danger. However, as Broderick’s Niko connects with the creature, the monster unfortunately appears tamer than it could have been. A truly wild beast could have caused more havoc and come across as much more threatening than how this monster portrayed with emotional baggage thrown in by the lead. 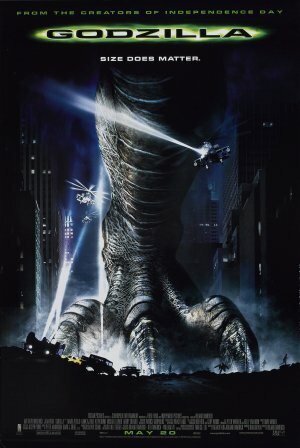 Godzilla creates an enjoyable version of a story that’s been done many times before, which is helped by the usual Hollywood backdrop of a major U.S. city and uses specific locations and landmarks to its advantage; the majority of the film is set in familiar places like a gutted and dangerous Madison Square Garden or a tank filled Central Park. Combining the familiarity of the settings and the brute force of Godzilla, the film is delivered on another level to the previous adaptations and tales of the monster, and also offers a higher budget blockbuster than the series has shown before. While the lead is an interesting change, it could have been fun to see what would happen if Godzilla was an unknown quantity to terrorise the streets. Maybe well see this again in yet another reboot of the American franchise. << Godzilla, King of the Monsters!